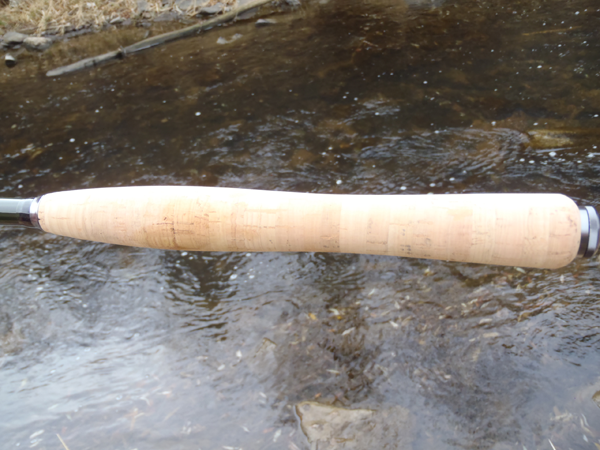 The Seiryu is actually the second rod I’ve field tested from Tenkara Centre UK. 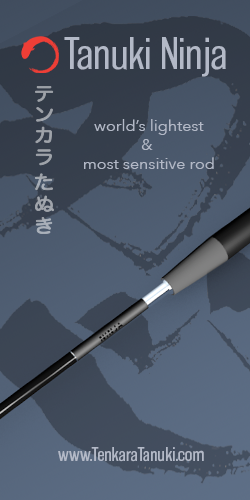 I recently viewed their new Masu rod and while it’s a great rod with a specific niche action and a lot of nice finishing touches, I think of the Seiryu more as an all purpose workhorse. You know the feeling you get when you pick up a new rod for the first time and the action just feels familiar? Like you’ve already built the muscle memory to cast it perfectly? That’s the way I felt with the Seiryu. It’s a true 6:4 that is easy to load and deliver a delicate presentation, yet can still punch a #4 level line through the wind on demand. I consider it to be a good all around action for anglers facing a variety of conditions. 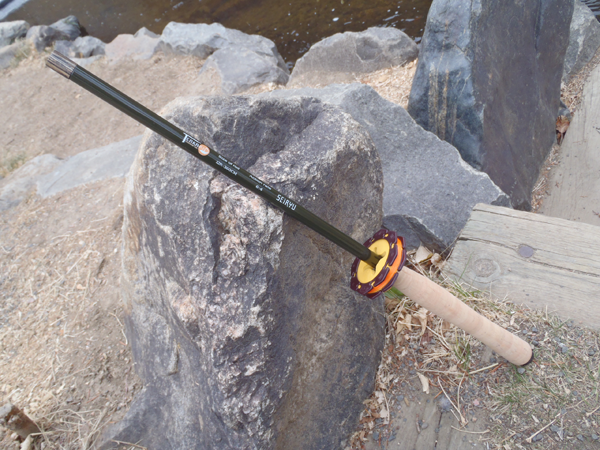 It doesn’t exactly excel in any specific situation, but if you could only carry one rod, this would be a good one to choose. 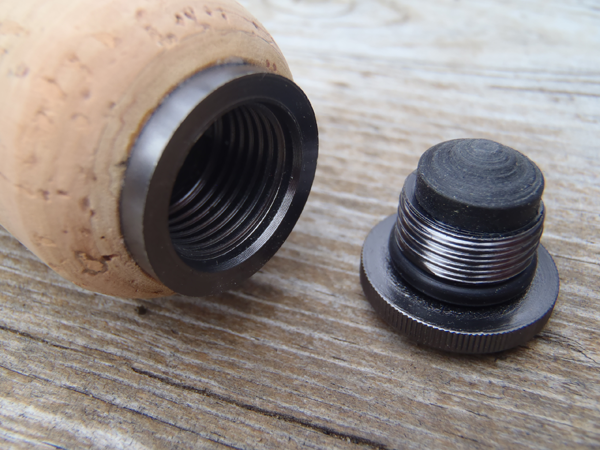 In my review of the Masu rod, I pointed out some nice finishing touches in the rod’s components such as rubberized cork accents. The Seiryu doesn’t have any flashy bling, but that’s OK. It may not be decked out with any fancy hardware, but that doen’t detract from the overall quality of the rod. The components are simple, but put together well. The grip features a nice taper that was equally as comfortable when held in the middle and at the very end and is high quality cork with little filler. The end cap is similar to many other rods I’ve tried. It’s tight fitting and features a good O-ring and rubber pad to dampen the sound of the sections clanking together when the rod is collapsed. At the business end, you’ll find nothing special–just the standard wood/rubber rod plug and red lilian. The Seiryu is a plain, yet elegant looking rod. I love the dark olive green color of the blank which acts as a good backdrop for the complimentary lettering and logo. No gaudy colors or flashy logos here. Overall, I think the Seiryu is a good all around rod. 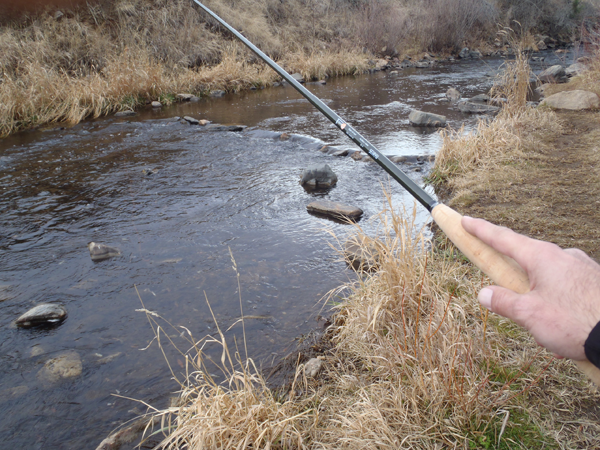 It’s nothing fancy–just a workhorse tenkara rod that gets the job done. It’s simple, yet effective. Just like tenkara. 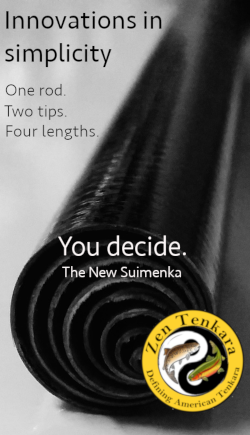 For more information, visit the Tenkara Centre UK website. I’m finally starting to look for my first “real” tenkara rod(currently use the Soyokaze) and just when I head over to your site to reread your reviews, there’s a new rod, you’re making decisions difficult Jason! I am sure it is a nice rod, but in my opinion is a poor choice of name. “Seiryu” is a whole class of rods, exactly as “tenkara” and “keiryu” are whole classes of rods. 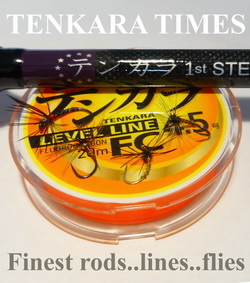 There are people who think “tenkara” is a brand name owned by Tenkara USA. People will now think that “seiryu” is a brand name – same with “keiryu” following Shimano naming their new tenkara rod Keiryu Tenkara. I have written about seiryu rods a little, and will a lot more in the future. 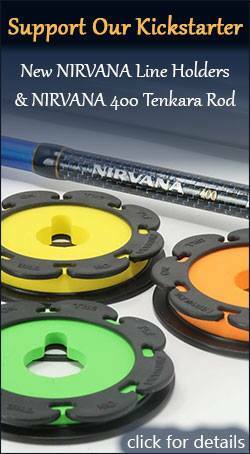 Similarly, I will write more about keiryu rods in the future as well. 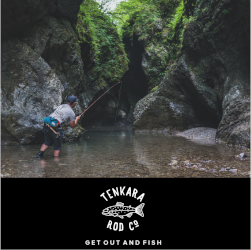 You have been quite critical about people calling rods that you say aren’t tenkara rods “tenkara.” I would have thought you would be just as critical going the other direction. 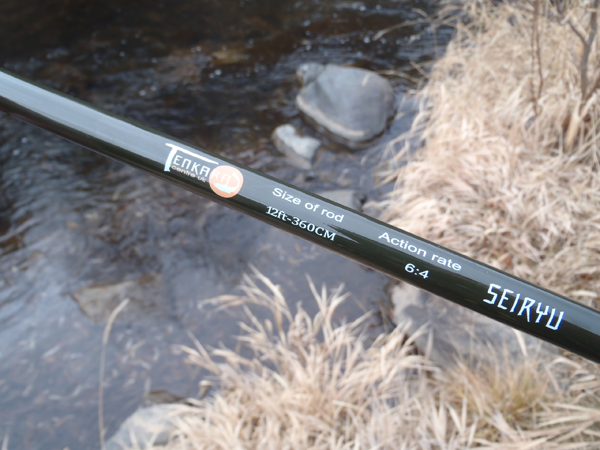 “Seiryu” means “clear stream” in Japanese and I’m sure that’s probably what the maker intended when naming this rod. While it may also be a class of rods, it’s just the name of the model and not indicative of what type of rod it is or a brand. I don’t think people will think it’s a seiryu rod any more than people think a Ford Mustang is a horse. Or that seiryu is the brand. It’s just a model name. 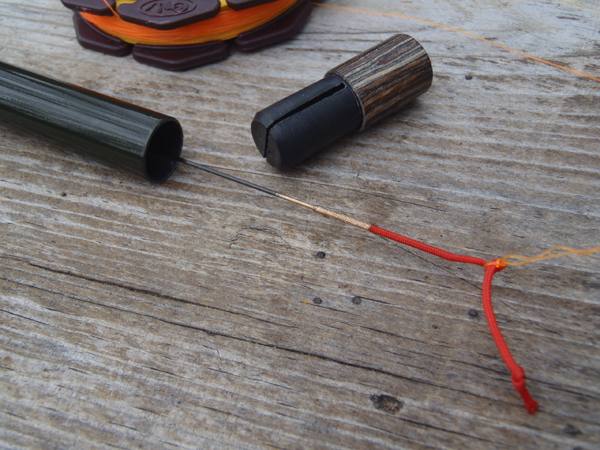 It’s referred to as a “tenkara” rod, not a seiryu rod. That’s probably making it even harder that there aren’t any rods to throw out right off the bat! Since learning about Tenkara last year I’ve been interested in the Ayu, but my favorite place to fish I usually use a 7′ 3-weight. Not sure if it’d be too big? And also the river I go to isn’t very fast moving to I’m not even sure how well traditional techniques will work. I’m still in the learning curve of fly fishing all together though. How much room do you have for a rod? Is there overhead coverage or just no room behind you? If you have room overhead you have room for a longer rod. 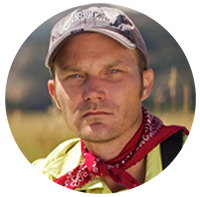 Micheal, the spot that I love fishing the most is about 100 yard stretch that is maybe 5-10 feet wide and has branches as low as 10 feet to the water in some areas. There is definitely some room to cast a larger rod in a few areas but overall a 13 foot rod would be tough I think. Especially for someone like me who started Tenkara this spring and who only started western fly fishing about 2 years ago. I’m sure with all the reviews between this site and TenkaraBum I’ll find a few rods in addition to the ones already recommended to me. I’m kinda wanting a 12 footer and I already have a couple T.U.S.A. rods so I’m thinking of trying something different. Thanks for the heads up on these rods. I live in NC and its really tight on the small native streams here. If you are used to a 7′ 3wt I would suggest trying what I do. I have the 9’3″ handles for my Iwanas. They arent 7′ but shorter than 11′ and I think they are similar to a 2 or 3wt rod. I really like them especially for dry flies. Just my two cents. Thanks Lance! I was already considering an Iwana for that application, so now I’ll definitely have to give it a try. Also for those looking for a shorter rod I’ve been really impressed with the Sakura Seki Rei 3.3m and I hear the Sakura Kongo 3.0m rod has a nice attitude to it. I think your comment was uncalled for. Not cool. That was directed at Chris Stewart. Know you something of the Anglo & co. rod, model Wasabi 40, ¡it look beautiful!. Hi Vasco, yes their rods look great but they only make them in 7:3 action. I’m waiting for them to make a 6:4. Jason: Today I took contact with Mr. Keijiro Suganuma of Anglo & Co. he told me that the rods are hand made so the production it is too little then the rods sell only in Japan. I sent him a new email telling that I can wait until he can make me one for me, but I don`t know what will be your answer. Also asked him if some distributor in Japan can sell overseas, ¿have you a confident or near contact with him or someone else in the company? or ¿know you how can buy a Wasabi 40 for me? Thank yo and best regards. Hi Jason: Some kinds of tenkara rod have no knot on lillian, there some people think the knot it is not necessary, other think the oposite, ¿wnat is your opinion?, I ask you because I ordered my second rod to US, and the lillian have no knot. Hi Vasco, the knot is necessary for the girth hitch connection used to attach furled lines but not for level lines. But since there is no disadvantage to having a knot, I tie one one all my rods so I can switch between furled lines and level lines. I hope that answers your question. OK I understand, it was what I imagined, work for the furled lines , thank you.